We have upgraded our loyalty program module allow the customers to gather points within an order, upon registration, while referring a friend or when posting reviews (only validated reviews). The points can be redeemed for discount on purchase. 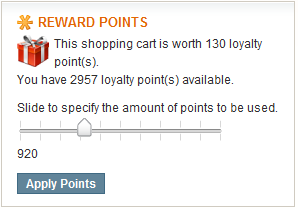 You can get reward points equal to 2% the fee you have paid for the products. These points will be carried to your account right after your order statuses are complete. It is possible to show the points you will get on product list pages. Your will automatically know the number of points he may collect, simply by browsing the products on the website, without the need of viewing products one by one. When you are viewing products, you know how many points they get on a product. The system also calculates automatically the points when quantity value is changed. The slider is optional. You can use select or input boxes as well. At anytime, you can check the points that you have collected from your account! There is a summary of points that you gathered and points spent. Full point history is also available in use account area! What about earning points when referring a friend? With our referral program, that will allow you to gather points when referring a friend. you can decide to share the referral link on your blog or social profile for example, share with the use of addthis button or even submit the referral form. For any first valid order placed by referred friend, your friend gets: 100 extra points. The new registered customers will get 300 points. This activity is only available for the registered members. The reward points can not be used with a discount coupon. The points being equal to 2% the fee means that you will get 200 reward points if you spend USD100 and every 100 points can be used as one dollar. Reward points can be used for purchasing products. Reward points are perpetual but without interest. The reward points in your account can not be transferred to other accounts. Sure Electronics reserves the right to the final decision about Reward Points in case of dispute.